(from point to opposite edge). 14 half fans that are sewen together afterwards. ch 1, turn at end of each row, unless otherwise stated. ROW 2: (right side) ; 3 sc in sc. ROW 3: 2 sc in first sc–inc. made; sc in next sc, 2 sc in last sc–inc. made—5 sc. ROWS: 4-11:continue increasing in first and last sc until there are 21 sc. ROW 12: 2 sc in first sc* sc in each of the next 4 SC, 2 SC in next SC; rep from 3 times more—26sc. ROW 13: Sc in each sc across. Ch 3(counts as 1 dc of next row), turn. ROW 14: Dc in first sc and in each sc across to within last sc, 2 dc in last sc—28 dc. Ch 1, turn. ROW 15: sc in each dc across—28 sc. Ch 3, turn. NOTE: to work a popcorn stitch (pcn st): 5 dc in same st, drop loop from hook, insert hook in first dc of the 5 dc group and draw dropped loop through, ch 1 to secure. ROW 16: ( pcn st row) Pcn st in first sc* dc in next sc pcn st in next sc; rep from * across, ending with dc in last sc—14 pcn sts. Fasten off. ROW 17: with wrong side facing attach B to first st, sc in each st across (including ch 1 at top of pcn st)—43 sc. ROW 18: with B sc in each sc across. At end of this row change to C as follows: work last sc of row until there are 2 loops on hook, drop B yo with C and draw through 2 loops on hook. Ch 1 , turn. Fasten off. Here after change colors in this way. ROW 19: with C 2 sc in first sc, sc in each sc across to last sc 2 sc in last sc—45 sc. ROW 20: with C sc in each sc across. At end of this row change to D.
2 rows ea of D, E, F, G, and H. At end of row 30 change to A. ROW 31: With A rep row 19—57 sc. Ch 3, turn. ROW 32: Skip first sc*pcn st in next sc, dc in next sc; rep from * across ending with dc in last sc—28 pcn sts. Fasten off. HALF FAN: 1 (make 7) : Starting at bottom point with A, ch2. Row 1: Sc in 2nd ch from hook. Ch 1, turn. Hereafter ch 1,turn at end of each row, unless otherwise stated. ROW 3: 2 sc in first sc–inc made on left side edge–3 sc. ROWS 5-12; rep rows 3 and 4 until there are 13 sc. ROW 13: Sc in each sc across. Ch 3, turn. ch 3 counts as 1 dc of next row, turn. 2 dc in last sc–inc made on left side edge–14 dc. Ch 1, turn. ROW 15: Sc in each dc across. Ch 3, turn. ROW 16: ( pcn st row): Rep row 16 as for full fan—7 pcn sts. ROW 17: With B rep row 17 as for full fan–22 sc. Ch 2, turn. ROWS 18-31 Rep rows 18-31 as for full fan in the same color sequence—29 sc, increasing on left side edge only. Ch 3, turn. ROW 32: Rep row 32 as for full fan—14 pcn sts. Fasten off A .
Pin together with large safety pin and set aside. HALF FAN 2: ( make 7) Work same as half fan 1, increasing on right side edge only. Pin together and set aside. BLOCKING: Pin each fan to measurements on a padded surface: cover with a damp cloth and allow to dry; do not press. ASSEMBLY: With right side up,invert the 3 white fans so that last pcn st row is at bottom edge of afghan. Select the multi-colored fans of row 2( half fan 2, two full fans and half fan 1) sew them to Row 1 with right side up, along adjoining edges working through back loops only of each st.. In the same way, sew the 3 multi-colored fans of row 3 in between the fans of row 2. Rep rows 2 and 3, six times more, joining each fan to the previous row. I didn’t like how the sides looked when I got it finished so I did a row of sc then a row of popcorn sitches. You will need an exta skein of white yarn to do this. It’s a lot more work to finish it this way but the end result is beautiful. Also I whipped stitched blocks together to assemble. I saw this pattern for sale in a magazine many, many (20?) years ago. Had never been able:-) to find it since, so I was so surprised to see it on Pinterest. Thank you so much for sharing it for free. yes it is a very old pattern but it is beautiful. My Grandmother made it for my Graduation present, I gave her the magazine with the pattern. I graduated in 1986, lol. Thanks for visiting my web site. Yes this pattern has ben around a long time and it seems it’s getting more popular now then ever. Sounds about right! My co-worker’s mom had just passed away at 83. While cleaning out her mom’s house, she found a large bag of crochet “fans” with this original pattern. It’s called “The Promise” (Rainbow) Afghan – Family Circle 3/19/85. Turns out, her mom had started this project many years ago but never finished. I offered to finish the afghan for her. I made this pattern as a wedding present for my college roommate in 1986 – 1987. I loved it but over the years lost the pattern. Thanks for sharing it! your welcome Cindy, thanks for visiting my website. My mother made this afghan for me when I was a little girl…it was my favorite! I’m 33 now, and the original has long since disappeared. I’m so excited to be able to make my own! Thanks Kate for visiting my site. Glad you found the pattern. Is the pattern 48 oz of yarn or 4-8 oz balls of yarn?? I love the pattern I just dont know where to get 48 oz of yarn from!! enough skeins to get 48 oz- 3, 4, 5, don’t know check the oz on the skeins you have and add to get 48 oz. This is beautiful thanks for sharing. I am a beginner just wounder if i would be able to do it. Hi Louise, Thanks for visiting my website. Yes this pattern is beautiful,you should not have any trouble with the pattern . just go slow and follow the instructions exactly and you will be fine. If you need additional help just let me know. I began this afghan many years ago, and have about 10+ of the fans done. Would anyone be interested in having those? Please know these were done when I first started to crochet any are far from perfect. Thanks for visiing my web site. Right now I don’t know of anyone who would like to continue on with your afghan but I will post this and we will see what happens. I would be interested to have the fans; if, they are still available. My pattern that I cut out of Family Circle magazine over 25 years ago is so worn I can barely read it. I have made at least 8 of these afghans experimenting with different shades of rainbow colors. Every one is unique and gorgeous. I found one in the closet that needed to be put together. Now I think I will make two more for my teenage granddaughters. Thanks for the instructions. Now I can print out a clear copy. I think that this is a afghan that I seen at the Mesa Co,CO county fair one year back in mid to late 80’s. I have never been able to find it. Thank goodness for people putting on google. Thanks for visiting my web site. It just so happens that I am working on a rainbow afghan now. I find the easiest way to join the pieces together is with a yarn needle and just use the whip stitch. If you will follow the diagram at the bottom of the page that will help also. Love this pattern, thanks loads for it and making it now but boy that music is annoying. How do I turn it off? sorry, it goes with the page. Try turning off your speakers. Just saw this afghan at our county Fair…it was beautifully done and took a blue ribbon of course! It is definitely on my “Knotty Grandma’s” To-Do list! Thanks Vonni for visiting my wesite. THis afghan seems to be very popular this year, I even made one myself. I’m wondering if there’s a mistake in the pattern or if I’m misunderstanding. “ROW 3: 2 sc in first sc–inc made on left side edge–3 sc. At the end of Row 4 I’m supposed to have 4 single crochets and the pattern continues with the one increase per row until Row 12. So at the end of Row 12 shouldn’t there only be 12 sc? Unless the next increase is in Row 13 but isn’t specified? The clarification would be great. Thank you. Other than this I haven’t had any problems with the pattern so far and it’s been fun. Sorry about the delay in getting back to you. My site has been down. I’m wondering if you are also counting the chain one in the beginning this may be where you are having a problem. try counting your chain up and let me know if that solves you problem. I know this is an old post but I’m having the same issue as Amanda. The pattern says we have 4 stitches after row 4.Then we are to increase one stitch per row until row 12. That makes 12 stitches not 13. I don’t understand what you mean by counting the chain one in the beginning. I’m thinking that row 13 must start with an increase in order to get to 13 stitches. Otherwise the pattern has come together beautifully. I,m still working to resolve this I,m going to look up the original pattern and see what it says. but just off the cuff, I think what the problem is, they are counting the ch 1 as the first st, in order to keep the one side straight you need to crochet in that ch 1 st. I haven’t forgotten about this. This is a stunning blanket and pattern . I’m new to crochet and was wondering do you have a stich diagram I can follow I’m still learning to read patterns and this way seems to help me understand . I really hope you could help me as I just love this pattern it’s AMAIZING and want to make in for my self. Thanks for visiting my site and your kind words. I’m sorry to say there is no stitch diagram for this pattern. When you are reading the pattern check first your abbreviations chart. then watch carefully for the commas in the pattern. If you need any further help just ask and I will try to help you understand the pattern. I had this pattern and was doing it, but lost the pattern in the move. the box that it was in was ripped open when It arrived. I was so sad because I couldn’t finish it now I can thank you so much. I really love this pattern. So glad you found your pattern here. It seems to be a very popular one this year. I was wondering how do you downsize this for a baby blanket. Any help would be much appreciated. I would try using a smaller hook and perhaps baby yarn instead of 4 ply. Hi there. I love this pattern! I’ve done 4 rainbows now but when I lay them together they don’t seem to fit. The way I read the pattern is that you only increase on the first row of each new colour (except colour b, where you don’t increase at all. But this means that the sides of my fan don’t come down to meet the top of the rainbow next to it. Does that make sense? Will it be okay when I sew it together? Or is it deliberately like this to make it more textured overall? I did try increasing every colour row instead but then it curved down too much! I look forward to hearing from you! As for the afghan, when you are making the full fans, there are increases on both sides. Its only on the half fans that the increases are on one side or the other. the half fans fill in the spaces on each side to make the afghan straight on both sides. My daughter started this around 1986. In her troubled life she lost the pattern. She passed away from Cancer in 2007. Now that I have found it I shall make 3 of them, one for her daughter and one for her son as well as one for her granddaughter. Thank you for giving us this treasure. Thank you for visiting my website. I’m so happy that you found this pattern. I know it means a lot to you and I’m glad I could be a part of it. Let me know how it turns out. I usually weave in all yarn ends or crochet over them as I go. My mother-in-law moved into independent living and planned to finish this afghan that she started probably 20 years ago. She had the pattern but when she went to the “crochet club” she came back without it and has no idea who walked off with it! Thanks for posting! Thank you so much for posting the pattern. I’m about half way through and my fans look beautiful. I’m a little concerned about piecing it together. To block it first, the patten says to pin it to the measurements. Do you have measurements to do this? Cheers! Thank you so much!! I truly appreciate it. After three months, the blanket is complete and it looks amazing. I decided not to add the popcorn stitches for the edging, but finished it with a row of single crochet. I also blocked it after I stitched the pieces together and it worked out just fine. Wish could post a picture. I’m so proud of it. I decided to donate to my daughters school for their annual auction. I sure hope it brings some revenue for them! Cheers! I’m so happy that things worked out for you. I always like to know. I would have been glad to see a picture of it. You should be very proud of the afghan that is a little more difficult then some. Thanks so much for sharing your story with me and my readers. Life can get really hectic at times but you seem to have handled it very well. I hope I have had a small part in your story by sharing this old pattern. Hang in there and Enjoy!! 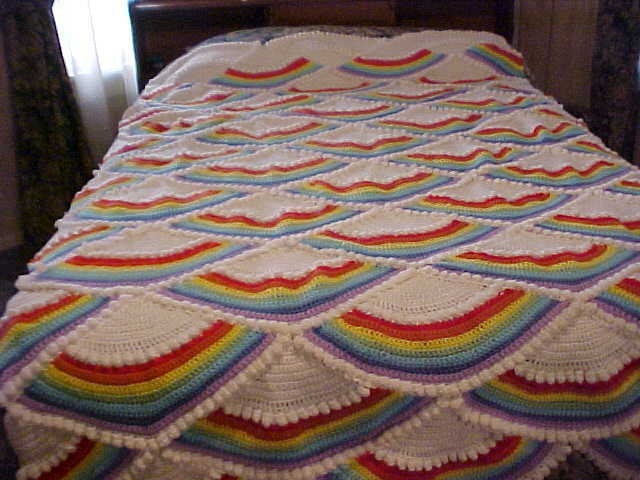 Do you have this beautiful rainbow Afghan for sale, or know someone who does? I would love to have one for my little girl. I have a friend who has asked me if I could make this for them. I am just curious, if there is a starting chain and if I could have some of the abbreviations defined. It’s cute, I love to crochet and have made many things. I was taught as a young girl to crochet from my mom. I have even made some things that I made up the pattern too. so would like to make this for my friend, just needed some clarification. I actually made this pattern about 35 years ago!! The pattern I have for it is really hard to read now so I was very please (and surprized) to find it online! For free no less!!! yes it seems that this pattern has become very popular this year,I’m working on one right now for a customer. I made this probably 30 years or more ago – my “car project.” Lost the pattern, thank you! Thanks for visiting my website. I’m always happy when someone finds a pattern they like. as for reducing the size, just use a smaller hook and baby yarn and you will do fine. I won one of these in 1987 handmade in a raffle, and still have it! Love it… have looked for a pattern with no luck. I had friended Donna Wolfe on facebook and asked her. She looked and said she didnt recognize the pattern, but she found it here within a few minutes. AM so HAPPY Donna found it. I am gonna try making it. Hi! My mom and I are working on making this afghan. We have several fans made and wanted to see how it will go together. We are really struggling to make sense of the directions. Our fans are not fitting together the way I think they are supposed to. Can you give more clarification? My granny passed away Dec 2016 at the age 101. She was making one and wasn’t able to finish. So glad to find this pattern. Thank you for sharing. Now I can try to make it. Love this pattern like I loved my granny!!!! So happy to be of help to you. I know that when you finish this it will be a treasure because it was started by your grandmother!! Hi! I have a friend that wants me to make this as a baby afghan. Any tips or ideas on how fans I would need or how I would go about doing that? Thanks! Try using 3 ply or baby yarn and a smaller hook. Make one fan, measure how wide it is ,then decide how wide your afghan should be.A baby afghan is usually 36X42 inches. Let me know how you do. This Afghan came up in my Facebook newsfeed as I am a member of several knitting and crochet pages. As soon as I saw it I knew I had to find it my granddaughter will love it. Rainbows apparently go with unicorns (her passion at the moment). I have until January to make for her birthday, wish me luck. Thank you so much for publishing pattern. I made one of these many years ago for my sister when she got married. She still has it and uses it! Time to make another one, so glad I found the pattern here! Thanks for visiting my website. Glad you found the pattern. Great pattern i like very much. Thank you Eva for visiting my website yes, the rainbow afghan pattern is very popular. This is absolutely gorgeous!! Would you provide a tutorial for this pattern? Thanks so much it is amazing reading these stories… brings back memories..and makes me feel older.